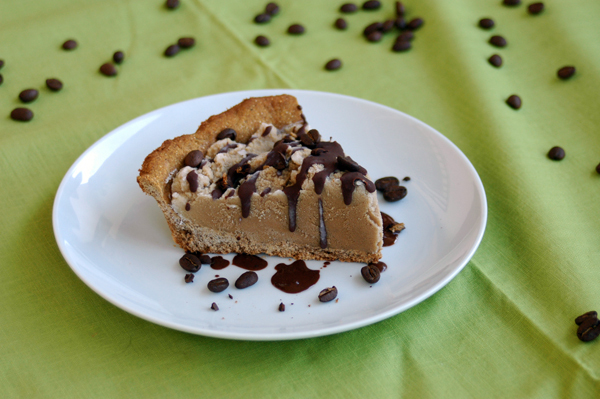 Before I get started on this amazing pie… let me remind you of the big giveaway! Don’t miss your chance to win a brand new Smart Scoop from Breville. Today is the last day to enter for a chance to win this baby! UPDATE: The giveaway is now running through Friday and will end at 12 pm!! I messed up on the original date/time and decided to pay for an upgrade to allow you all more time to enter for a chance to win this amazing machine! Cafe con Leche… rich and creamy with just enough sweetness to gentle the bitterness of the coffee, but not too overwhelming sweet that you can’t taste the richness of the coffee. Everything about this ice cream pie reminds me of my days as a barista at Zanzibar’s Coffee Adventure on Ingersoll in Des Moines, IA. I sure have fond memories of those days. 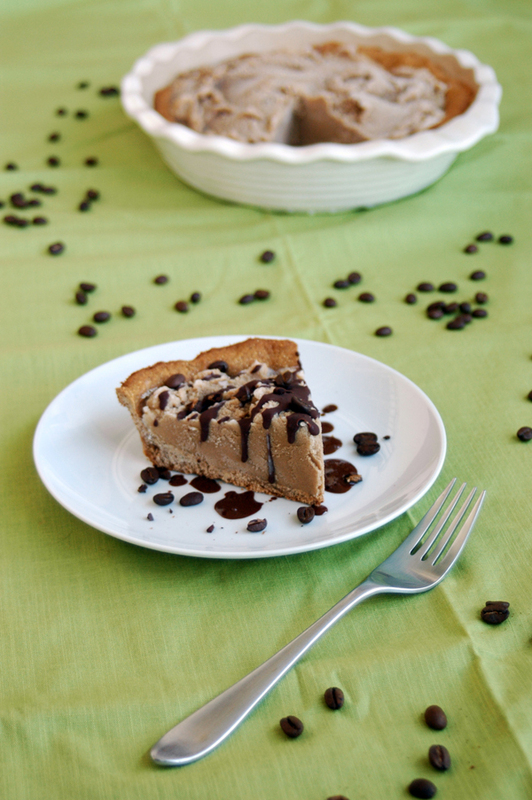 Creamy and cafe-licious… this pie was truly a winner. Especially topped with some chopped coffee beans and chocolate magic shell. I used my cold-brewed coffee to make this, but you can just brew up some strong coffee and use that. But I have to say that make cold-brewed coffee, also called toddy, makes a huge difference in flavor, seriously. Hot coffee tends to be bitter and harsh while toddy is sweeter and smooth. Its amazing and delicious! I learned to make cold-brewed coffee while working as a barista and some of my favorite drinks called for toddy… especially the Polar Bear Smoothie. If you are ever in the Des Moines area, make sure you stop by Zanzibar’s and order a Polar Bear Smoothie. It is truly amazing… so good that I made an ice cream version of it in my Just Making Ice Cream ebook. Hmmm………. okay, enough daydreaming. Back to this ice cream pie. There are two ways to make this ice cream… fast and easy or slow and easy. The fast and easy way is to simply whip up the ingredients and pour into your ice cream maker, but the end results will be more icy than creamy because of the water added in from the coffee. It tasted great, but if you are looking for more of a creamy texture… then the slow and easy way is what you want. The ten minutes or so spend on cooking the custard was truly worth the time and effort. I rarely make custard-based ice creams as I am more of a “whip it up and throw it in” kinda gal, but I made an exception with this ice cream. It really doesn’t matter if you use 100% cream, its the yolks that will help make this ice cream creamy. For the crust, you also have two options. The first option is to make a meringue crust. It is completely grain-free, but the texture is not crunchy… more like chewy. I love the crust because you can throw in most anything like coconut flakes, chopped nuts or chocolate chips for flavor. But if you are wanting more of a crunchy crust. This gluten-free graham crust is the second option. 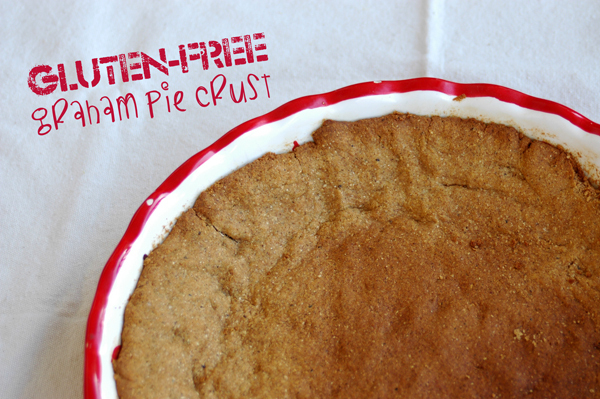 You can get the gluten-free graham pie crust over at the Grain Mill Wagon where I posted it today. 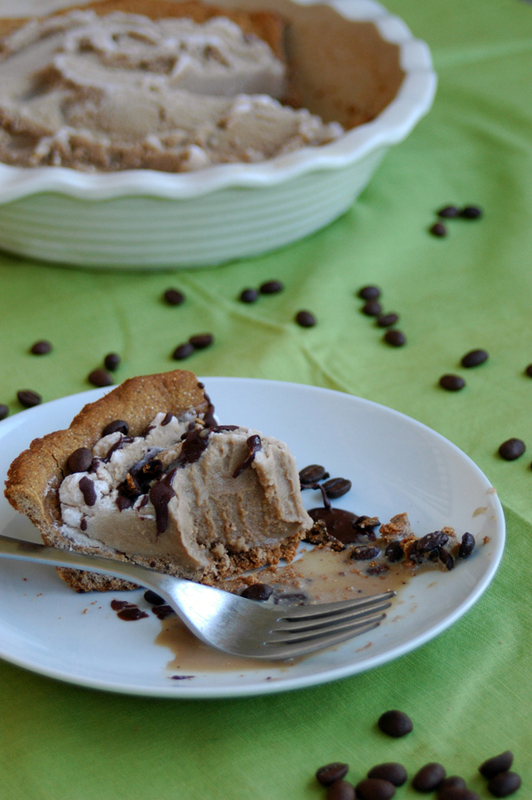 I’ve made other ice cream pies using this crust and it has been good so far! 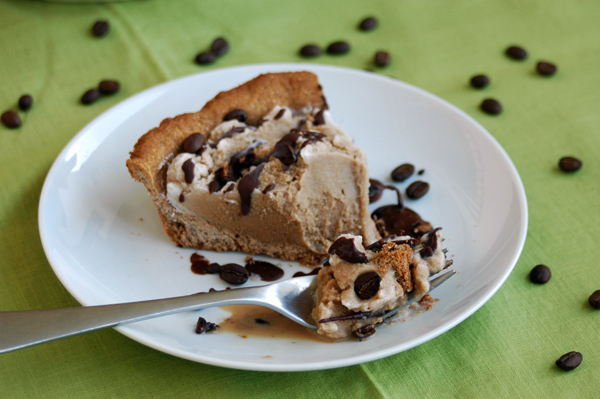 Now, let’s head into the kitchen and make one a Cafe con Leche Ice Cream Pie… or you can just enjoy the ice cream and skip the crust! Fast option: Simply whip everything except the yolks (or add the yolks for nutritional benefits). Pour into your ice cream machine and follow the maker’s directions. Slow option: Pour 1 cup milk, coffee, sugar and sea salt into a sauce pan over medium low heat. Stir to dissolve the sugar. Lightly whisk the egg yolks and slowly pour them into the coffee mixture, whisking constantly. Keep stirring constantly while warming the mixture over medium low heat. Continue to stir until the mixture thickens slightly and coats the back of the spoon, this should take about 8-10 minutes. Don’t let the mixture come to a boil! Combine the rest of the milk and vanilla in a medium size glass bowl and pour the warm mixture into the cream. Stir well and put the mixture in the fridge. Serve right away as it is or scoop it in to your choice of pie crust (graham or meringue) and freeze it for a few hours to firm up. When ready, serve it with some chocolate magic shell and chopped coffee beans! 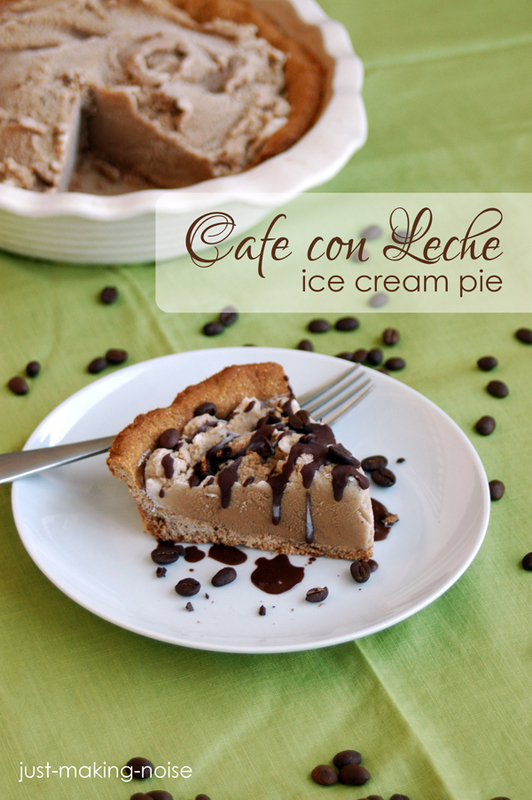 Think you will make some Cafe con Leche Ice Cream? I hope so!! I made just the ice cream for dessert last night, and the flavor was delicious (although my toddy should have been stronger). My only issue was that it was icy after I made it and it sat in freezer. It had a frappuccino texture, rather than an ice cream texture. Is this because of the coffee? Or did I do something wrong? How many eggs did you use? Did you make sure to cook it long enough for the base to thicken? Usually it would take about 10 minutes… more or less. Also, what milk did you use? Yes, it is the coffee that is making the texture icy because it is water, but the milk and eggs are supposed to help keep it creamier. These ice cream look so delicious lol even better than the ones from game Papa’s Freezeria, awesome blog, Yummy!